Kyle Trader, a 2004-2005 Troopers member, sent this picture. During Thanksgiving break, we Troopers in the Denver area tried to organize and get together to talk about times past, the upcoming 2007 season, and the November camp this weekend. Although we couldn't get every member from the area, it was still a good time. 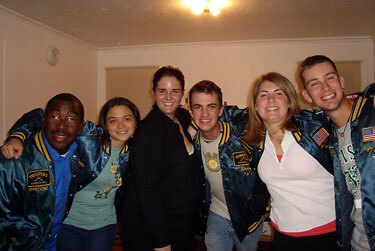 Left to right: Trevor Bailey (Baritone, 2003-2004), Vicki Thiem (Soprano, 2004-2005), Megan Cross (Baritone, 2005), Dieter Wiselogel (Baritone, 2003-2004; contra, 2005; Blue Knights euphonium, 2006), Justine Williams (Mellophone, 2005; Boston Crusaders mellophone, 2006), Kyle Trader (Soprano, 2004-2005; Blue Stars trumpet, 2006).